Personalized Pet Bowls | Customizable Dog Bowls | That's My Pan! 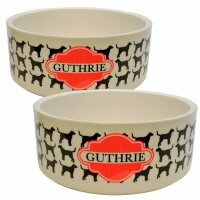 Designer series pet bowls feature several fun designs and allow your personal color choices on our large 7" white pet bowl. Designer series pet bowls feature several fun designs and allow your personal color choices on our large 7" white pet bowl. This item comes as a set of two bowls, with the same design on both bowls, but with potentially different personalization.